Pediatric Cardiology Center of Oregon (PCCO) has been at the forefront of medical care for children and adults with congenital heart disease since first opening its doors in 1986. PCCO’s pediatric heart program has pioneered important advances in the treatment of congenital heart disease. Plus, our affiliation with Legacy Emanuel Hospital and the Randall Children’s Hospital means that our patients receive first-rate care in a state-of-the-art building designed and built specifically to promote a healing environment for children. 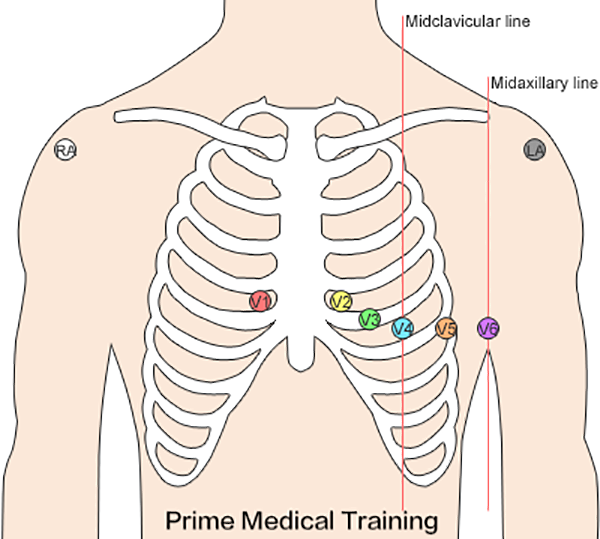 As part of our continuing effort to educate the broader community about our medical services and best practices for treating children with congenital heart disease, we thought we’d take a moment to go over the basics of pediatric ECG lead placement. Americans may be more familiar with the acronym “EKG” (which derives from the German Elektrokardiogramm), but most medical practitioners use “ECG” (electrocardiogram) for the process of recording the heart’s electrical activity using electrodes. The electrodes are placed at specific points on the patient’s skin in order to detect electrical changes in the heart that may indicate cardiac problems. It’s the placement of the ECG leads (labeled with a V) that we’re focusing on here. For infants, toddlers, and children under 90 lbs, measuring rib spaces is not usually possible. For all ECGs, limb leads should be placed on the limbs — not the torso. Arm leads should be placed just above the elbows. Leg leads should be placed between the knee and ankle. One final tip: If computer interpretation reads “Right Superior Axis Deviation” or “Northwest Axis,” be sure to check the limb leads. PCCO operates outreach clinics throughout Oregon and Southwest Washington, so we’re never too far away. Contact Pediatric Cardiology Center of Oregon for more information on our world-class pediatric care and to find a location near you. The pediatric cardiology center at Randall Children’s Hospital boasts a state-of-the-art medical facility with a full team of cardiology specialists who are focused on providing their young patients with the best care possible. The Randall Children’s Hospital in Portland, Oregon prides itself on offering the best treatment for their young patients, with a team of individuals focused on cardiology, surgical procedures, and other aspects of a child’s development that can all come together to ensure that they get the playful, healthy life they deserve.